DACT/DACXT filters protect Diesel engine’s injection pumps, exhaust valves and piston rings better than any other equipment. 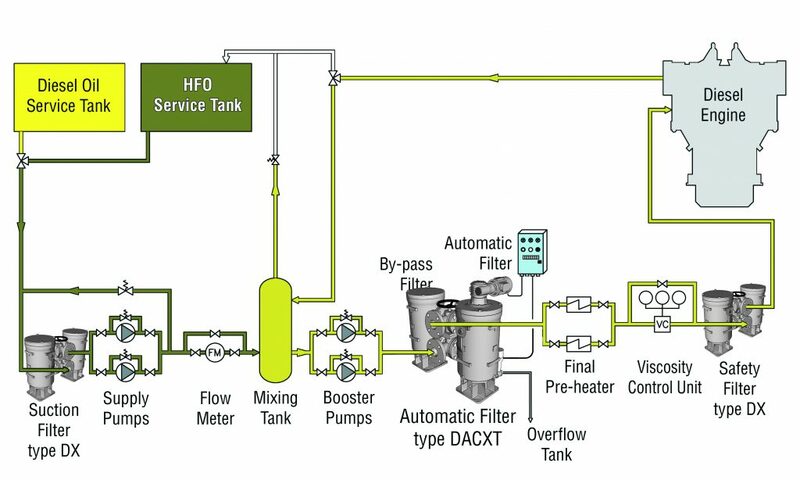 Removal of the damaging particulate from catalytic refining, that cannot be removed by the centrifugal separator since it has a specific gravity equal or lower than the fluid itself, requires a filtration degree of 10 μm absolute that only DACT/DACXT can provide. An outstanding feature of DACT and DACXT filters is the use of the same filtered fluid for the cleaning cycle, consuming only 5 to 10% of the filter’s volume. For any cleaning cycle, there is a real saving of about 90 to 95% of fuel in comparison with filters cleaned by compressed air or static, that require the complete emptying of the filter’s body every time. It may be calculated that a typical Diesel engine with supply flowrate of 0.6 to 6.1 m3/h and filtering degree of 10 μm absolute, will save 12,500 to 110,000 liters/year considering an average of 4 cleaning cycles per day. Backwash is performed very quickly (about 4 to 10 sec.) and requires very little fluid, considerably less than the volume of the filter. Consequently, there is no need to waste fluid for “refilling”. The only difference between DACT and DACXT is the shape of the flanges. While DACXT has standard DIN PN 16 flanges, DACT has special square flanges for more compactness. DACT and DACXT filters may be installed either on the cold “Supply” side or on the hot “Booster” side, since they don’t use external backwashing fluids and the filtering element is made of stainless steel. The “Safety” or “Indicator” filter is installed after the automatic filter for protection purposes only. The frequent clogging of this filter indicates an irregular operation of the automatic filter.